Adjust each strap once and buckle on the harness with one click, then you're good to go! The innovative Quick-Fit Harness is the answer to every dogs (and their owners) dreams! One click of the buckle on the Quick-Fit and the dog and owner are ready to go. This unique harness is designed with a Neoprene chest sleeve to cover the adjustment chest strap. Reflective stitching offers enhanced visibility at night, and a stainless-steel ring attaches to the leash. While exceptionally functional, the Quick-Fit is built for comfort. Every pooch will have a perfect fit because the patent-pending system tells owners if the harness is the wrong size by showing them a red tab. As easy to use as a collar, which is why we added the ID tag holder. For best fit measure the girth of the dog. This is the area behind the front legs and around the body. The neck will typically fall into place once girth is determined. If the measurement is close to the end of the size range, go up to the larger size. "I love this harness because its so quick to place on and it looks COOL! The harness is nice and comfy on my dogs chest and has great adjustments so it fits perfectly!" 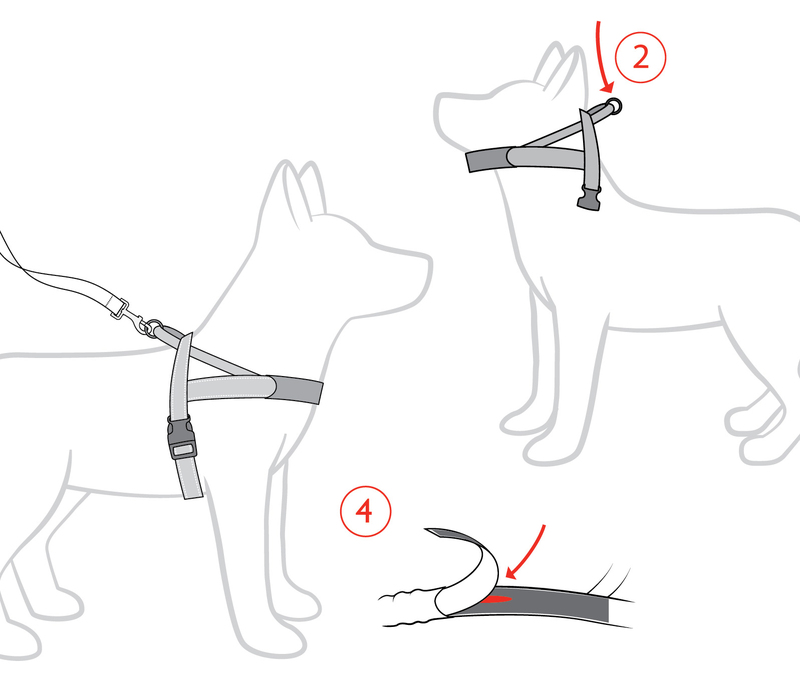 " The Quick Fit Dog Harness is very simple to put on and off. Straight over the head and just one clip. Our cavoodle sits very happily for the on/off and my kids can do it by themselves. We're just re-sizing from XS harness bought when our puppy was 9 weeks to a medium harness now she's 6 months. Very easy decision to buy same again. Our cavoodle really likes her harness - for her it's walkies or going for a drive both of which she loves doing. She walks/runs along really well and sits/lays very comfortable in the car. It's a great product and highly recommended for it's simplicity. " "I have a dog whose missing a front leg, so finding a harness that would stay on and not cost too much was proving to be difficult, I bought the Quick Fit Harness originally to use as a car harness, but ended up trying it on walks as well. It's really great, due to the chest strap it doesn't fully rely on both front legs to stay on, there's only a slight slipping on the missing leg side but apart from that it works really well." "Awesome harness, have used this harness to secure george the dog ( border collie cross with cocker spaniel) in the back my land cruiser ute with the sides of the tray removed, have always felt the dog is secure, quick to remove and install on the dog. Has lasted a long time. " "We bought our puppy this harness originally because it was adjustable under his chest. This one is a replacement for his original 5 year old one which we only replaced so it would look good next to his new lead!!" "I have a very large stubborn Dalmatian who loves to pull. He is accepting of the harness because it's quick to put on and must be comfortable for him. There is less pulling and he seems happy. In fact, we are both happier with the harness, "
"Very easy to put on our jack russell terrier and maltese. I was a little concerned that the clip would cut him but there is an extra protective layer to prevent the cutting and we just make sure it's not too tight. " Great Harness but not for my dog. "I bought this as i thought it would be light and easy for my pugalier but unfortunalty it rubs under his shoulder and cuts him. He is also able to escape it, So I am back to using my ezy dog convert harness which is wonderful! " "Smooth Fox Terriers are an odd shape, being very deep in the chest but quite narrow across the shoulders and proportionately small around the neck. My girl was also nearing the limit of size between small and medium, so I took Ezydog's advice and went for the larger size. These harnesses have plenty of adjustment and really do go on the dog quickly. Other harnesses we've tried don't have sufficient length in the chest straps when the correct size for the shoulders and neck has been selected. They're also lightweight, dry quickly and are yet to be escaped from. I particularly like the tab to hang an ID tag on which is separate from the ring to attach to the lead. All up I'm 100% happy with the choice of this, especially for beach usage where these dogs are of an leashes regularly and in and out of the car." "Brilliant Product - Quick Fit Harness. Came across this harness at one of the popular pet stores in town but they didn't have my dogs' size. So I went direct to the company. I discovered that there was a great range in colours, and sizes that would suit my dogs over and above what the pet store could offer. The harness is truly a brilliant product and most certainly lives up to its name 'quick fit'. I highly recommend this product to every dog owner. "